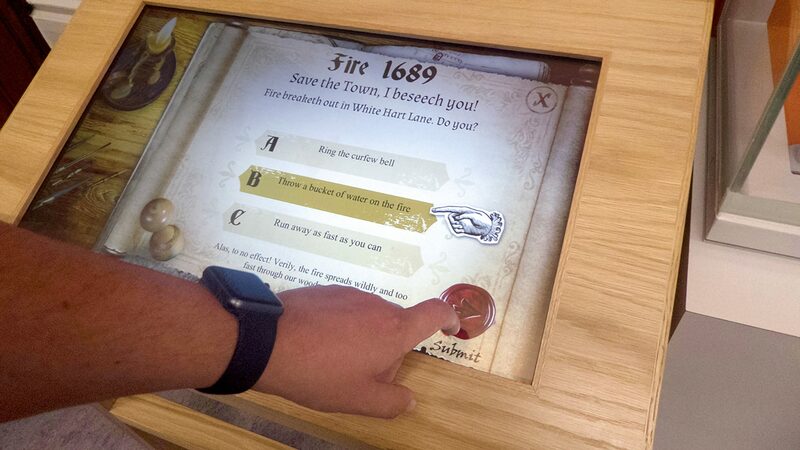 A touchscreen interactive, audioscape, oral histories and tablet video encourage visitors and local people to engage with the heritage of St Ives. The Norris Museum is based in the centre of the historic market town of St Ives, Cambridgeshire. It has a diverse range of collections, mostly related to what was once the county of Huntingdonshire, which include the remains of mammoths found locally, items of social history, and paintings from an important colony of artists working in the Ouse valley between 1880 and 1930 as well as manuscripts, photographs, printed books and newspapers. Heritage Lottery funding has supported the development of the museum which ensures that the collections can be easily accessed and explored by visitors, enabling people to engage with their local heritage. 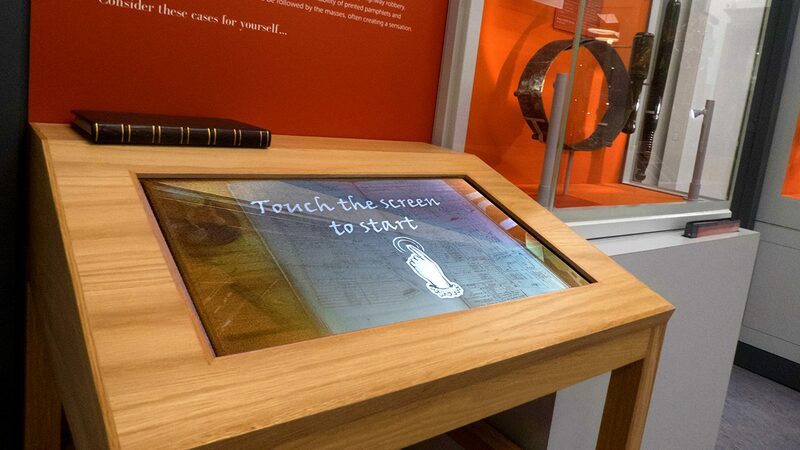 We were pleased to collaborate with specialist heritage designers, PLB, to supply the digital interactives software, AV and hardware on this project. Edmund Pettis was a St Ives shopkeeper who kept diaries and made a wonderfully detailed survey of the town and surrounding area in the 17th and 18th century. The Pettis Survey itself is too fragile to be on permanent display but provides the inspiration for this digital interactive. Using the incredibly rich hand drawn details of Pettis’ survey as its start point, the interactive employs extensive illustration, 2.5D and 3D animation to bring the document and period to life. Pettis needs help completing his survey of the local area in time for an important visit from the Duke of Manchester. A door opens, dust and leaves blow across the desk extinguishing the flickering candle. The silhouette of a horseback messenger casts across the desk as a letter dated 1728 is delivered fresh from Huntingdon. The letter opens and the challenge is set for the visitor to assist Pettis in completing his survey. As the visitor flicks the letter away, an inked map is revealed but several sections are incomplete and handwritten notes encourage the visitor to finish them. As some sections appear to move, the visitor is enticed to discover more. The visitor is presented with challenges that allow them to complete the missing areas of the map, revealing interesting facts each time. Each successful challenge adds to the picture with images of smallpox sufferers and of dramatic events such as the disastrous floods, and Great Fire of 1689. 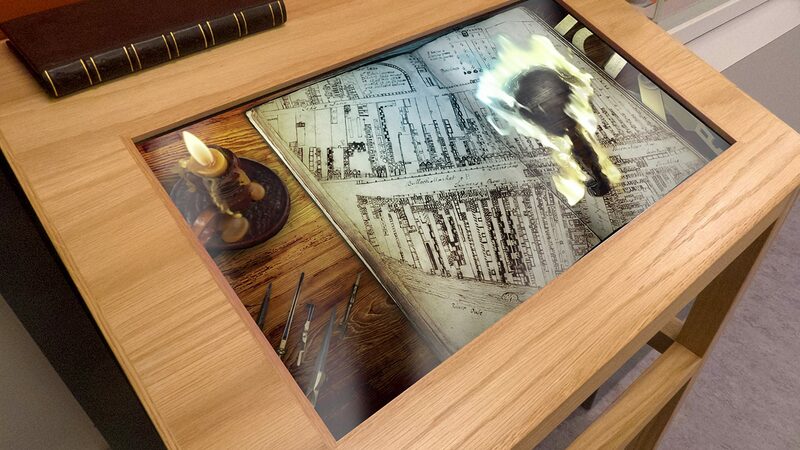 Wide Sky Design worked closely with the client’s subject matter experts to specify, develop and script the interactive. Creating challenges that reflected the subject matter of Pettis’ historic document, demonstrated the development of St. Ives and incorporated Pettis’ own words from the survey. 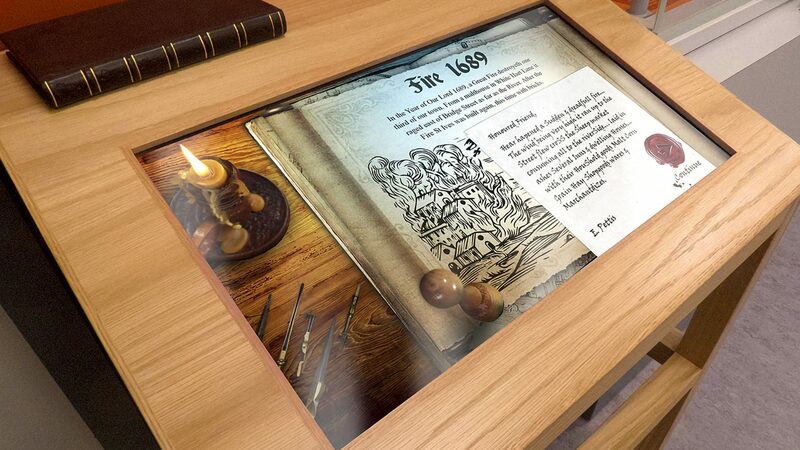 Content is written in the language of the period to immerse visitors in Pettis’ world. Some of the more gruesome hardships of life are balanced with tongue in cheek animations making the experience suitable and memorable for visitors of all ages. 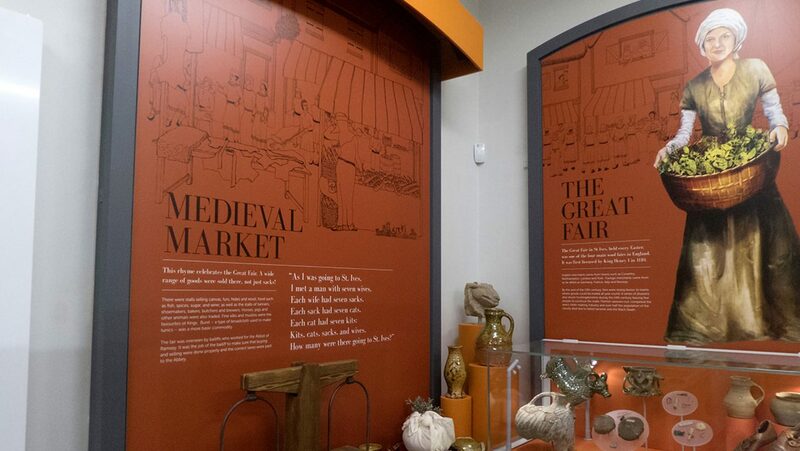 The Great Fair at St. Ives was an event of international significance with traders arriving from Flanders, Brabant, Norway, Germany and France and the second largest in the UK outside London. An audioscape, triggered by visitor activity evokes the atmosphere of the Great Fair, reflecting the content of nearby interpretation and artefact displays. Wide Sky Design researched, scripted and created soundscapes exploring the unfolding day, from barges unloading at the wharf, local and international traders selling their wares, the bailiff collecting tariffs and making health and safety checks, through to some of the more dubious activities in the evening! Special effects audio and mediaeval dialogue recorded by professional actors bring the market, its traders, bailiff and visitors to life. The famous St. Ives rhyme is used as a recurring theme throughout the piece to link the various scenes. A Bakelite telephone that has been refurbished and specially adapted rings to catch the visitor’s attention. 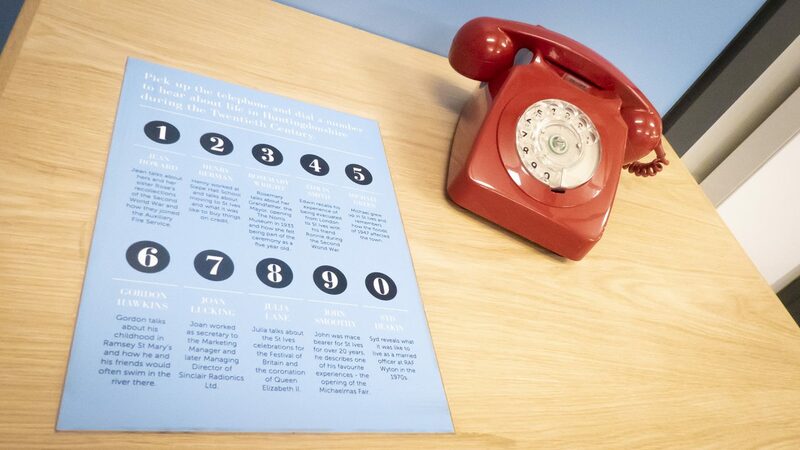 On answering it they are given instructions on how to dial to hear oral histories of first person stories relating to life in Huntingdonshire during the 20th century and, in particular, the first and second world wars. 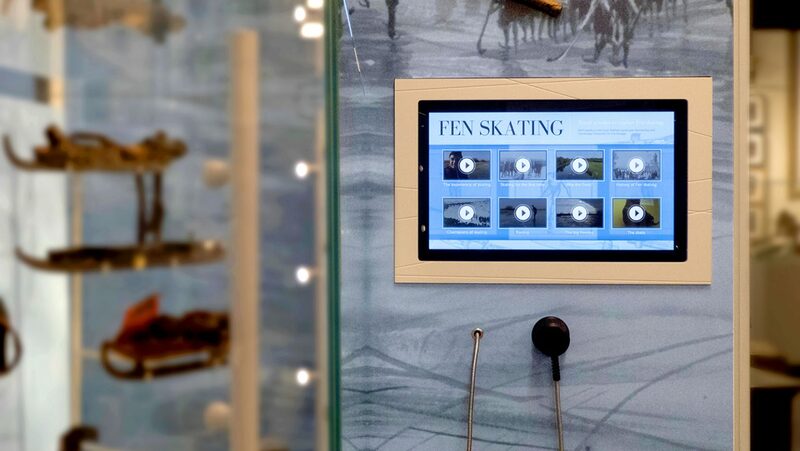 This interactive touchscreen gives an introduction to the history of Fen Skating, including its origins and famous champions, bringing the story up to date with footage of modern skating. The exhibit features a film, ‘Chasing Ice’ that has been produced by Ouse Washes Landscape Partnership, specially edited and subtitled for this exhibit. 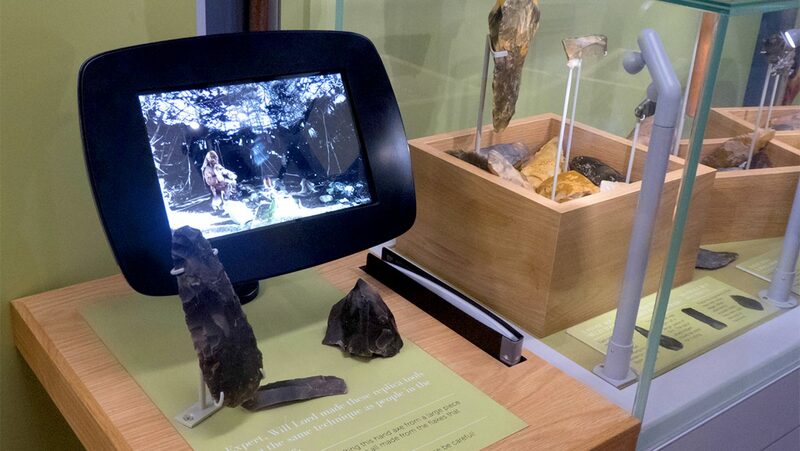 A tablet shows a video of the traditional craft of flint knapping which has a long association with the area. Throughout, we have used our rigorously tested software which complies with all accessibility requirements and holds all content in our content management system, allowing the client to easily update the content in the future. The hardware systems are tested using the software and content throughout the development process and installed on site with full manuals and maintenance agreements. We were also responsible for fitting out the museum’s education room with projection and audio systems, a flexible set-up that allows any device to be plugged in and used in a variety of educational activities. In addition, we supplied the projection system for the Museum’s temporary exhibition space.